I am so excited to show you these beautiful portraits.‘Layers’ is a collaboration between myself, make-up artist Jade Soar and photographer Asiko and will be on display at The Southbank Arts Centre from 8th March 2016. Further exhibition details are found at the end of the blog post. ‘Layers’ is a collection of photographic portraits celebrating the stages of a woman’s life. Women from various backgrounds – aged between 19 and 90 years – were photographed in front of an evolving flower wall during a three-week period. 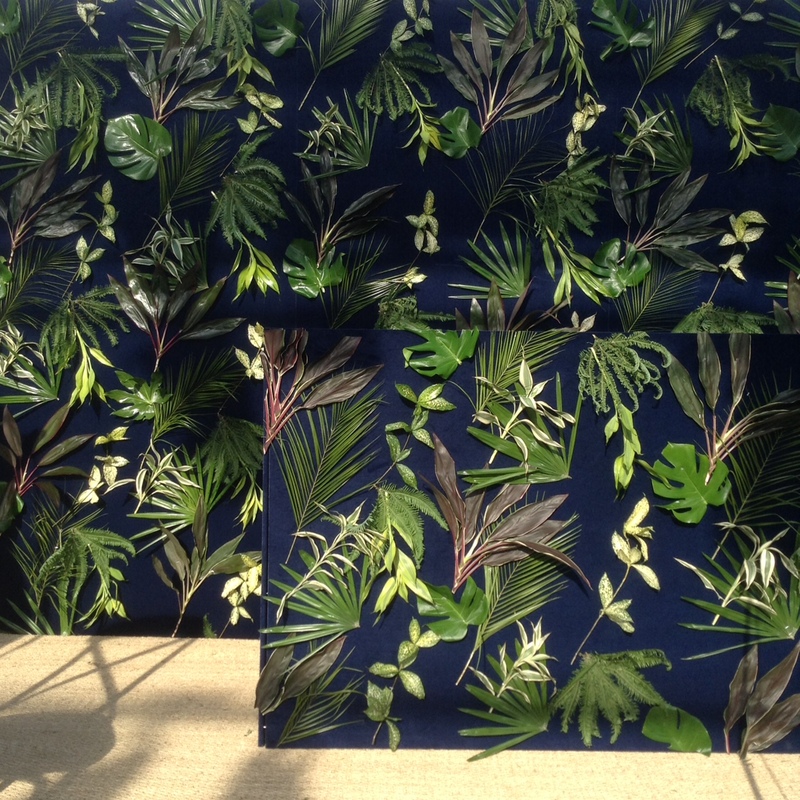 Layers of freshly picked British flowers were added to the wall as the project progressed. The added layers represent the growth and depth of wisdom women gain as life progresses. Jade and I are old friends, we had shared views on the adulation of female youth within the media and wanted to work on a project that offered a counter story to that. We wanted to create something beautiful that celebrated all women. Asiko is an art photographer who’s work Jade and I admired, so we were thrilled when he commented on an image that Jade and I had created on Instagram. We immediately contacted him and met up. The concept of ‘Layers’ was created during that meeting. We all felt strongly about a pro women project that explored the passing of time, inner growth and how our connection to nature changes as we grow older. I love the idea of using garden flowers as an artist medium. To me, flowers are nature’s paintbox – their fleeting beauty, that makes way for new growth, has always captured my imagination. These qualities inspired me to create the flower wall for ‘Layers’. I wanted the backdrop to the portraits to change over time, with some elements fading, allowing new layers to be added. The wall portrays our connection to nature, the passing of time and growth. I was lucky enough to hand pick every flower used in the wall. The flowers came from two cutting gardens within 10 miles of my studio. Bosley Patch in Henley-on-Thames is a cutting garden run by Tamsin Borlase and Babylon Flowers in Watlington run by Juliet Bennett. Two phenomenal women who grow wonderful flowers for florists. When I told them of the project they immediately invited me to their cutting gardens and allowed me to walk through the borders cutting flowers as I went. Pure joy and a huge thanks to them for all their support with the project. We selected our models by asking women we admired. We wanted to show real women as they really are, no airbrushing or over styling. We wanted an authenticity to shine through the portraits, we didn’t want a polished look. We wanted faces that could tell a story. “Boredom is nothing to fear! It actually takes deliberate actions to get bored and get stuck, you won’t just fall into it by accident and be unable to escape – so chill out, stick with things a bit. But don’t regret any of the pell-mell adventures either. It’s such a daunting task sorting through hundreds of photographs of my work, trying to narrow it down to just a few. My arrangements seem so varied, from classic shapes to outlandish creations. I am slightly over whelmed by the task ahead. 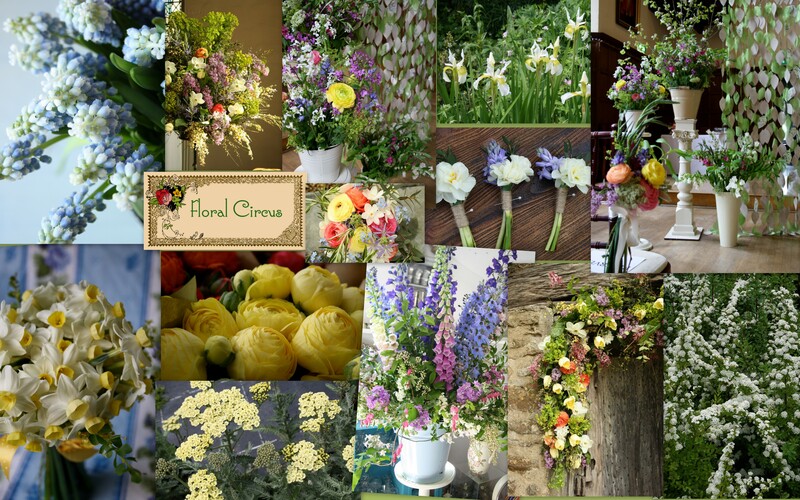 Anyway, I’ve made a start (always good) and selected twelve bouquet shots to celebrate Twelfth Night and here they are. 1.An early spring bouquet created for Rebecca. 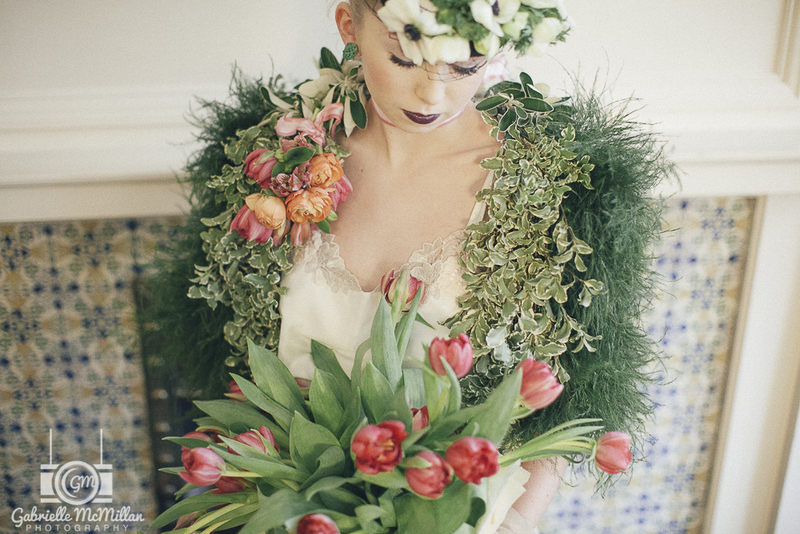 I used soft hellebores, ranunculus and tulips for the main body of the bouquet and added sweeping ferns to create a vintage tear drop shape. 2. Kate asks for lots of garden texture in her spring bouquet. That’s not always easy early on in the season, as many of the bulb stems snap if unsupported. Most of the texture here is created with parvifolia eucalyptus and a pale pink broom. 3. May is such a vibrant time in the garden, so I was thrilled when Catherine opted for a riot of bright colours for her wedding flowers. Here is her bouquet of sweet peas, coral charm peonies, delphiniums and scilla. 4. Beccy’s June wedding flowers included soft blush peonies mixed with highly fragrant ivory garden roses. Both elegant & romantic. 6. Blush roses with strong blue nigella made a striking combination for this mid summer bouquet. The fever few running through softens the bouquet, giving a summer picnic kind of feel. 7. It was great fun creating this bouquet for a primary coloured wedding in August. Teresa had great style and pulled the whole look off brilliantly. 9. 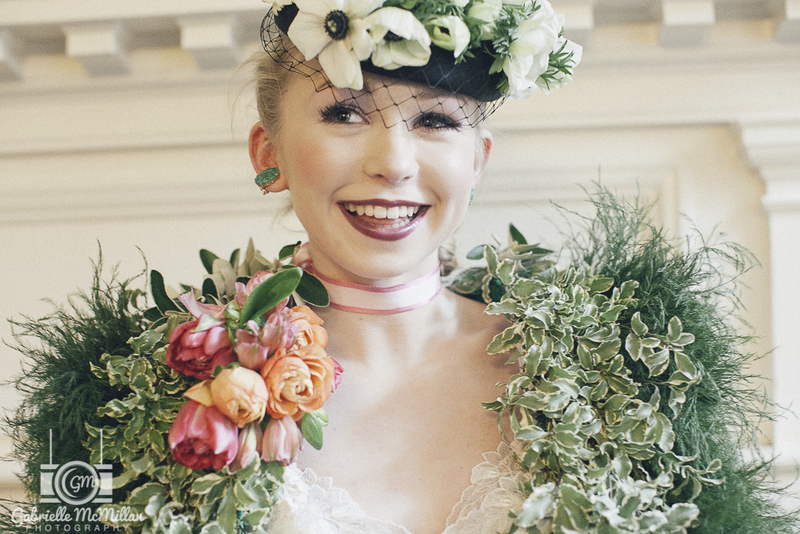 Poppy’s wedding was an English Country Garden affair with soft pastel roses, achillea and scabious. Wisps of panicum grass give a feathered outline to the shape. 10. Natalie’s late summer wedding was packed full of dahlias, snowberries, snapdragons and astrantia. 11. This textural bouquet of roses and grasses was created for Emma’s late summer wedding. There was an accent of deep peachy pink running through, so I was pleased to be able to use the 2nd flush of heuchera flowers in it. 12. And finally…An explosion of autumn colour for Natalie’s October wedding. A mass of berries, dahlias and craspedia. Bright, textural and unmissable! A huge thank you to all my brides, for choosing me to create your wedding flowers and allowing me to show them here. Also, much appreciation to all the wonderful photographers credited to these images. I do have lots more photographs of my wedding work, which I love equally as much and hope to show on my new website soon. 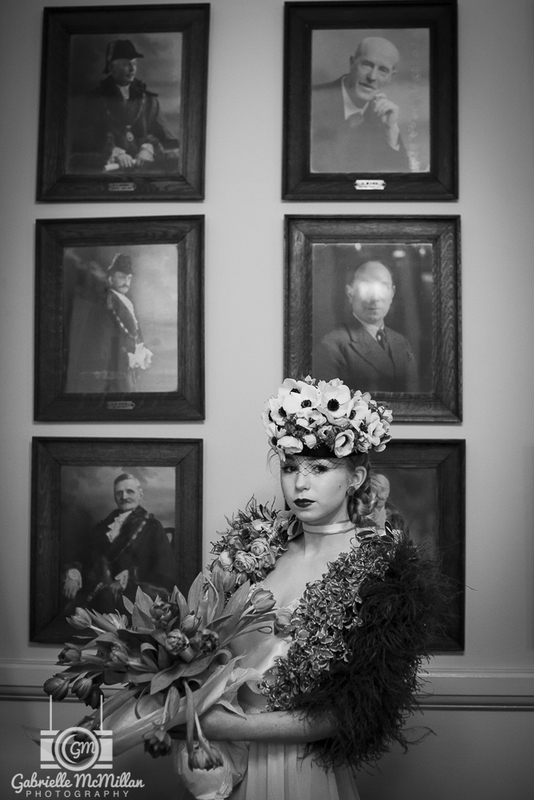 and hosted a Floral Couture & Cocktail evening for Chelsea Fringe. 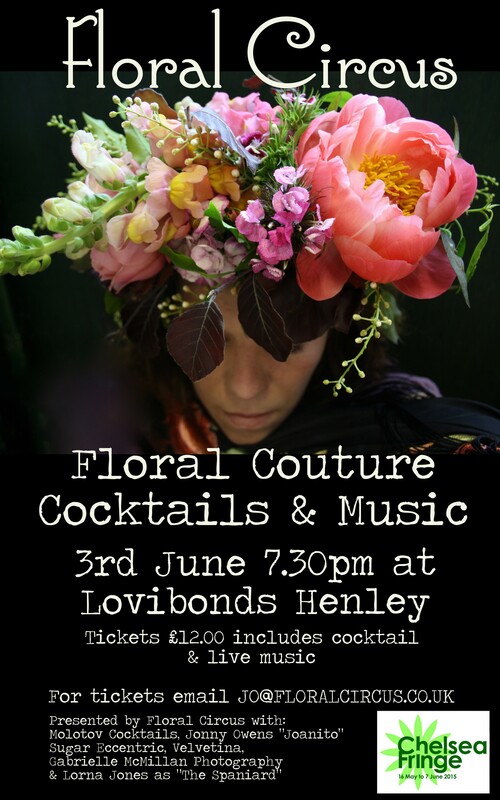 “An evening of Floral Couture & Cocktails” took place back in early June at Lovibonds in Henley. I was attempting to re create a little known Matisse painting “The Spaniard”. 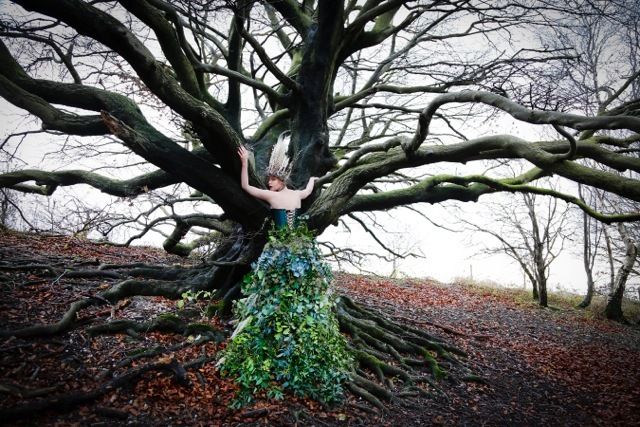 Chelsea Fringe Festival celebrates all things of a horticultural nature. As long as it’s legal, anything goes. It’s inclusive, creative, quirky and I love it! I knew I wanted to be involved right from the start and had a fairly good idea of what I wanted to do. 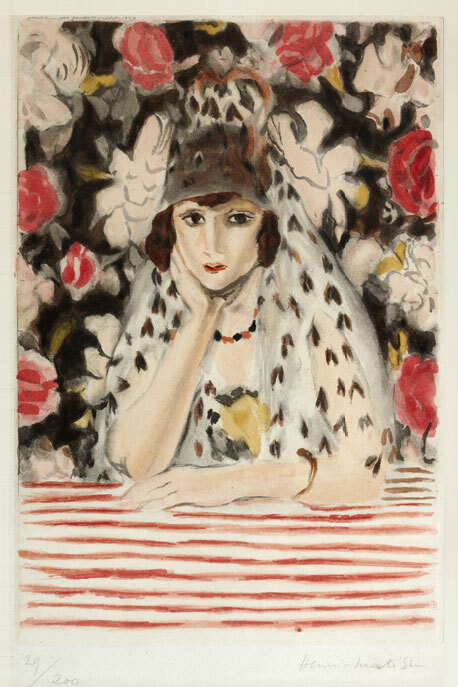 Matisse’s portrait “The Spaniard” is of a young woman in traditional Spanish dress. She inspired me and intrigued me, I found her beautiful & enigmatic with a story to tell. The bold floral design behind her lent itself well to a fresh flower installation and the title seemed the perfect anchor to create a whole evenings entertainment. 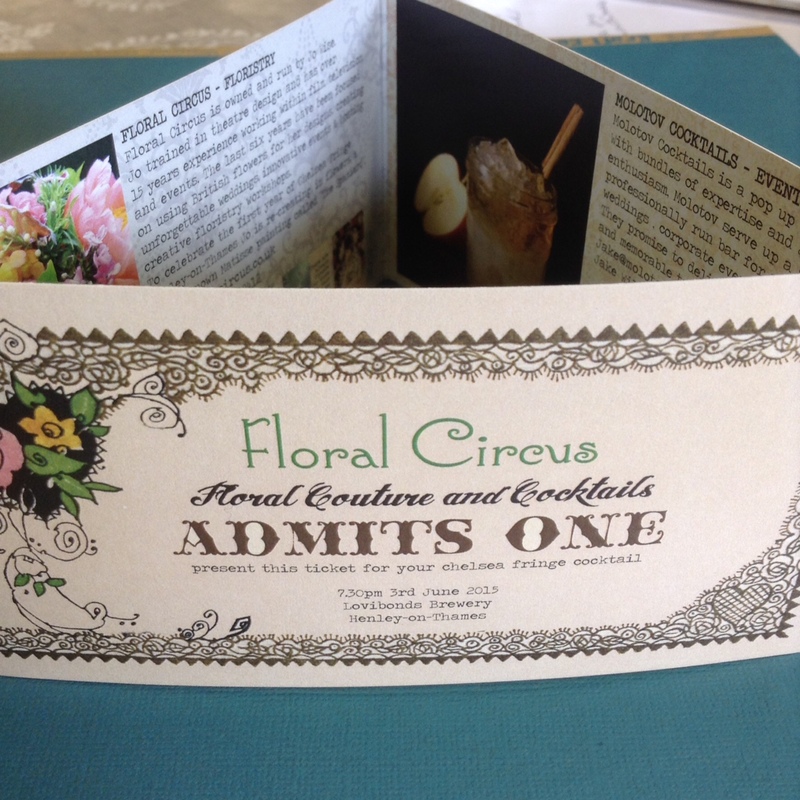 I was keen for the event not to be a static experience and wanted to try and live up to my name “Floral Circus”. I knew guests weren’t sure what to expect, but with a ticket price of £12 which included canapés and a cocktail I was hoping people would think it was intriguing and worth coming along to see what it was all about…..and they did. It was a sell out, with the help of a fantastic write up in The Telegraph. 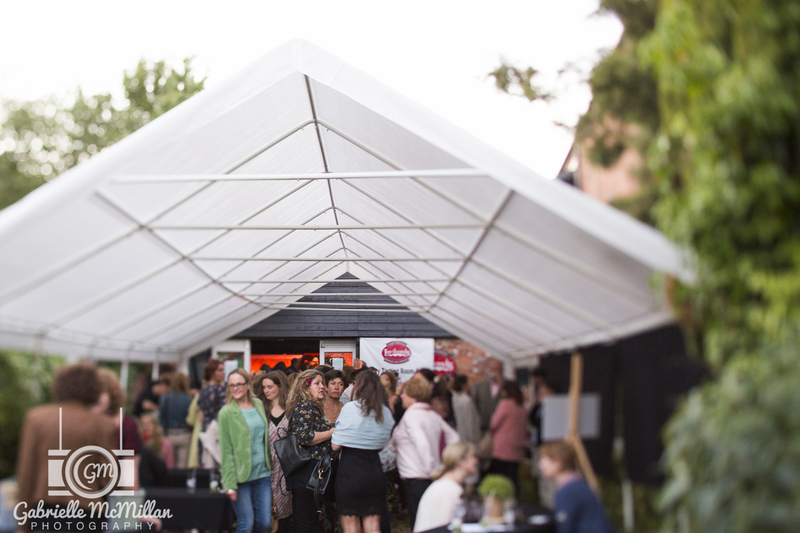 Click here to read more about it and other Chelsea Fringe events. 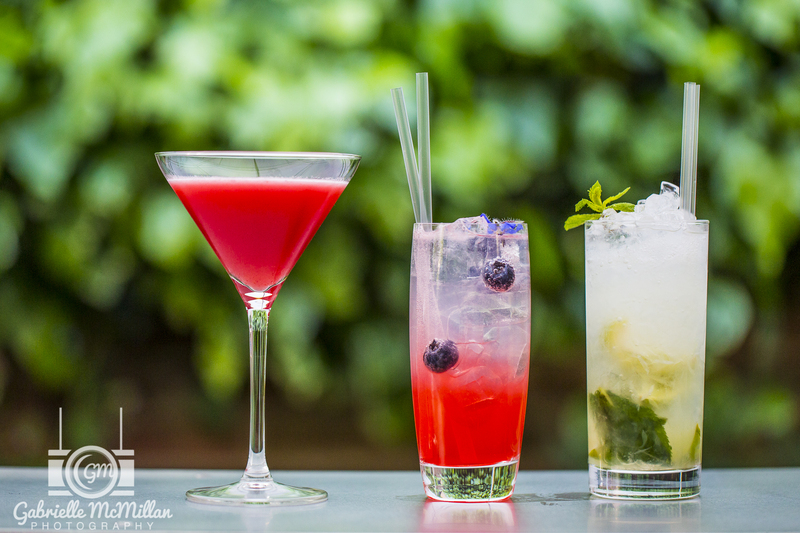 The evening started with Molotov Cocktails mixing up strawberry dacharis, mojitos & their own chelsea fringe cocktail from a pop up bar in the courtyard. 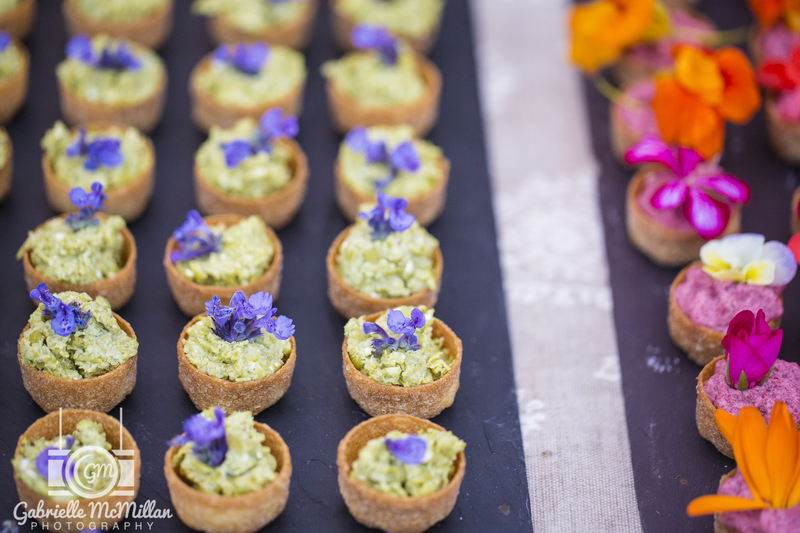 Guests could then enjoy fresh flowers canapés from Sugar Eccentric. These were so beautiful and tasted amazing. 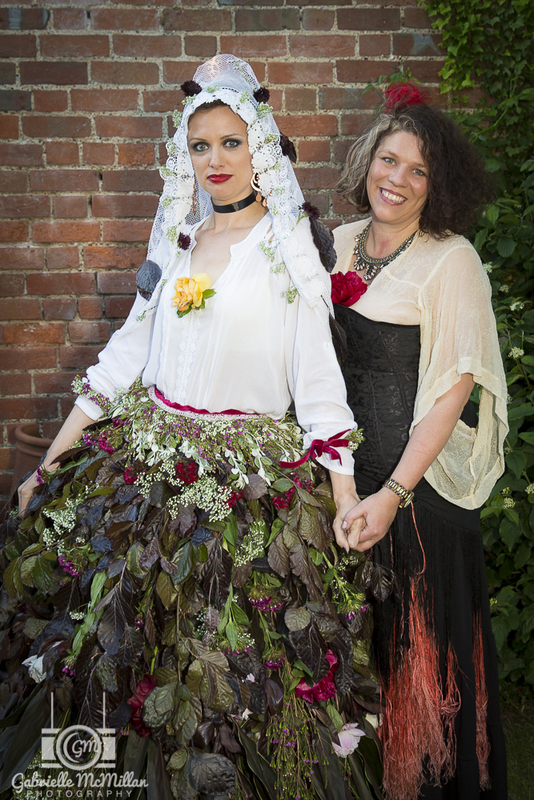 The edible flowers were provided by Bosley Patch in Henley on Thames. 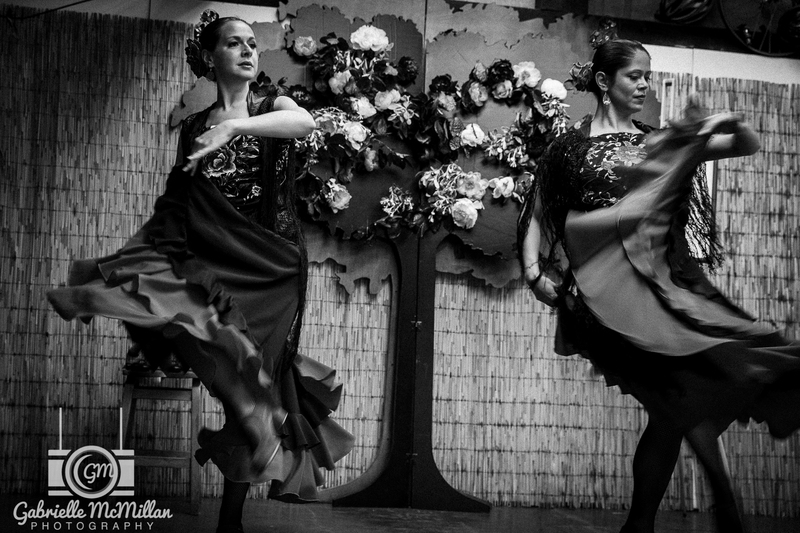 Flamenco dancers, Georgina and Danielle treated us to an exciting performance. They looked amazing in full length red flamenco dresses and the wooden floor at Lovibonds was perfect for their dramatic stamping. It really got everyone in the mood. 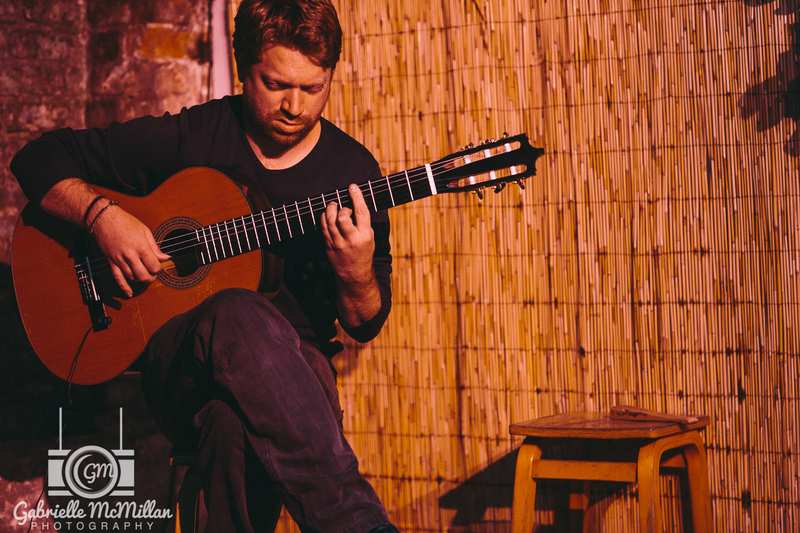 After the energy of the dancing Jonny Owens began to softly play some magical Spanish Guitar. Sarah Coleman sang acoustically to announce the entrance of Lorna Jones as “The Spaniard”. Two flowers girls scattered rose petals for her to walk on as she passed through the crowd. 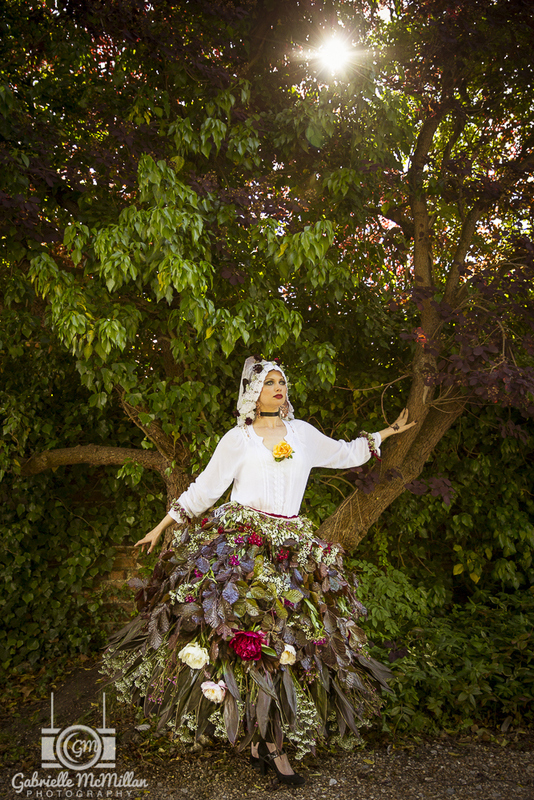 Once the procession arrived at a peony covered tree “The Spaniard” struck a pose and Sarah Coleman sang “Away with the Faeries” written by Sam Brown, who also accompanied her on the ukulele. I’m so excited to show you these gorgeous images taken by Gabrielle McMillan at the Henley Town Hall earlier this month. 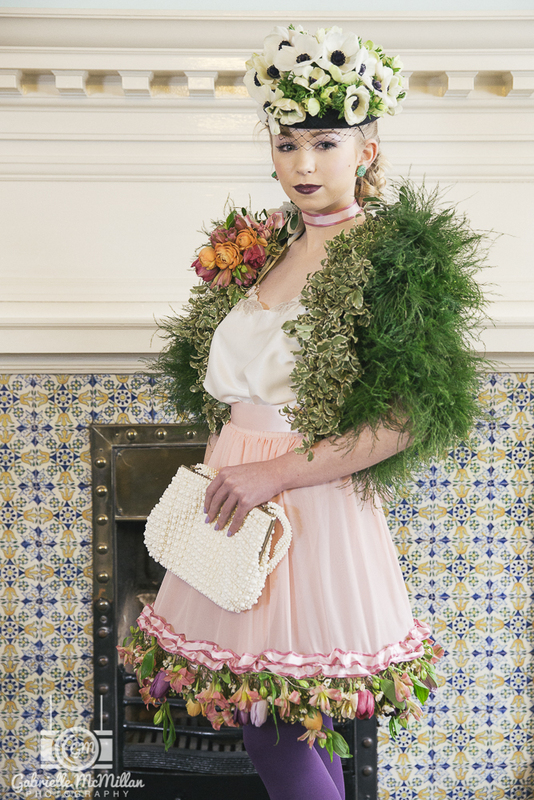 I was asked to create a floral couture piece to appear on the catwalk at the Henley House & Garden Show and other than using fresh flowers and it to be spring like, the brief was completely open. 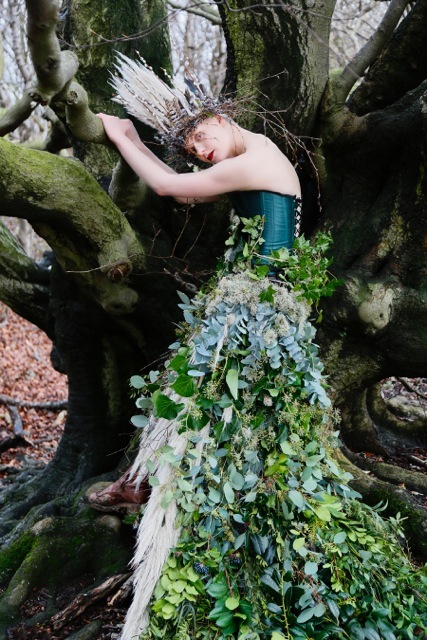 Back in December I had created a gothic looking piece for a shoot called “Keeper of the Trees”(see my last blog for images). 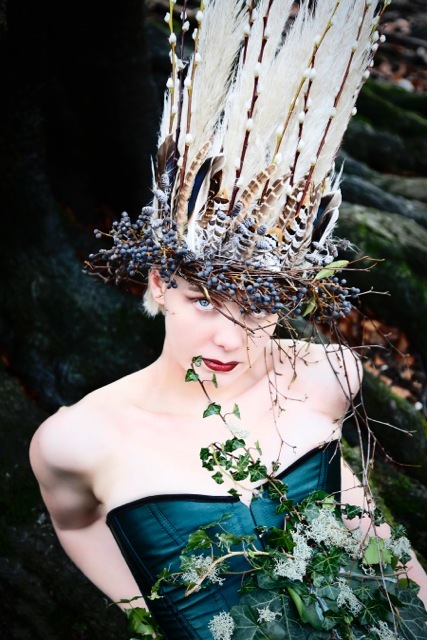 This foliage dress had a long trail, high hat and a touch of vampire glam about it. I knew I wanted the new piece to be completely different. I wanted it to be young, fresh, fun and pretty. As the show was to be early spring my first thoughts were of a pill box hat of white anemones. Once I had decided on that, the tone was set for the rest of the outfit. I sketched out a girl wearing a little bolero and a knee length floaty skirt. I was certain I wanted the jacket to be well tailored and be able to move with the model, so I needed to choose my materials carefully. The last thing I wanted was for the model to look like she was wearing a rigid box. The skirt needed to swish, so I decided to keep the fabric light and just create a fresh flower trim which would hold the skirt out slightly to add to the movement. I wanted to use as many English flowers as possible so decided on anemones, tulips, ranunculus and alstroemeria for the hat, trim and corsage. I struggled to find anything English that would hold so early in the season for the main body of the jacket, so had to make a slight compromise there and order in some fresh tree fern through the dutch auction. I did manage to source some English pittosporum for the lapel. The fern worked perfectly. It was dainty but robust, allowing me to weave each strand into shape. The shoulders into the sleeves was the hardest section to get right. I felt the success of the jacket hung on the shoulders and neck, these were the key elements to ensure the jacket had a good line and stayed looking like a wearable garment. I was really happy with how the lapel turned out, fitting the model beautifully. Floral Couture has to be created quickly with the main bulk of the work happening the day before it’s going to be shown. Otherwise you run the risk of it all wilting and looking awful. So, there isn’t any time for fittings, you’ve just got to go for it and hope you’ve got it right. My model, Amber Martin was so perfect, 16 years old and gorgeous. A huge thanks to her. During the last couple of months I have been designing events for the season ahead and my imagination has been brimming with garden flowers, I can hardly wait any longer to start arranging with them. Now the carpets of snowdrops have finally arrived, I feel spring is just around the corner and there is so much to look forward to. 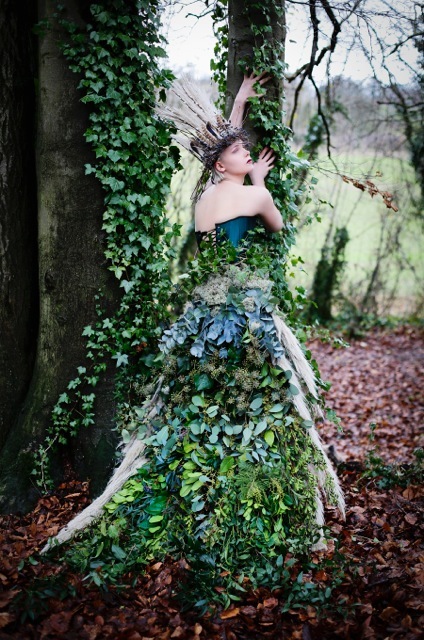 With all the positive feedback I’ve had about the foliage dress, I’ve been spurred on to design a new piece of floral couture which will be created for the Henley House & Garden Show. I’ll be sure to post some photographs of it….as long as all goes to plan! This piece has been inspired by the 1960’s with a little pill box hat made from anemones. I won’t say anymore just now, but I’m really looking forward to creating it later this week. 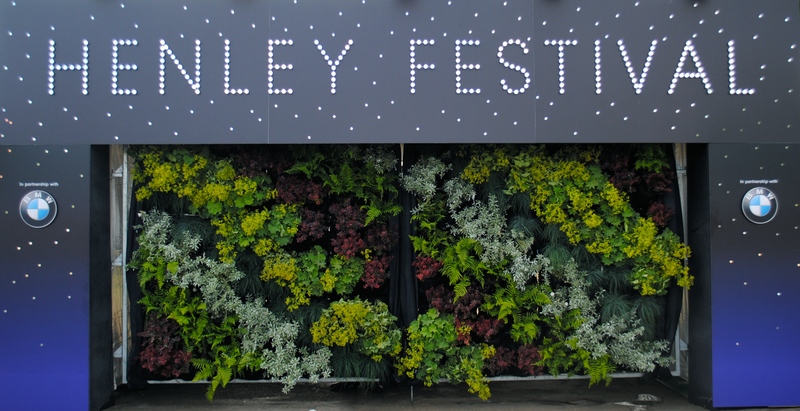 This year will be the first ever Henley Chelsea Fringe festival. A floral flotilla on 16th May will launch three weeks of horticultural flowery fun with events happening all over the town and surrounding area. 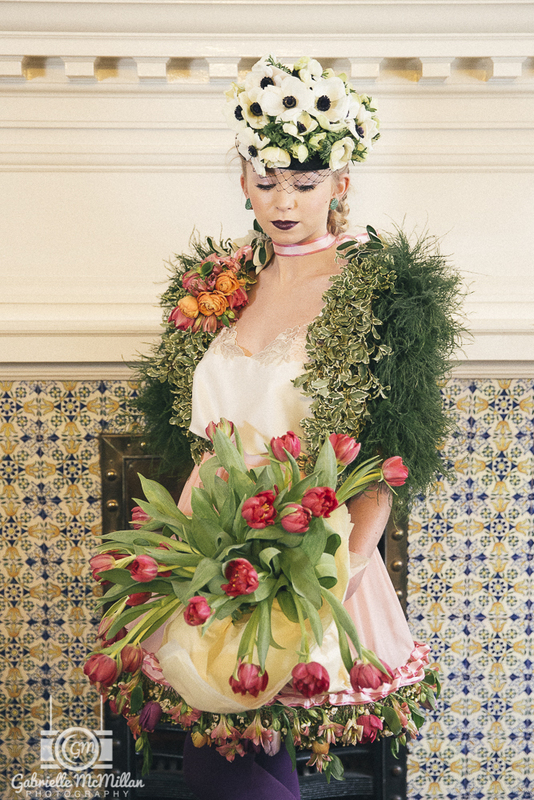 I will be hosting an evening event of floral couture and fresh flower cocktails at my studio 3rd June. I’m really looking to it and hope to see you there. Fresh garden flowers for a spring time wedding. Soft yellows and blues with pops of pink to bring it altogether. Light delicate blossoms with scented narcissi, tulips, ranunculus, anemones, muscari will all be available for you during April & May. Who am I when the flowers go? 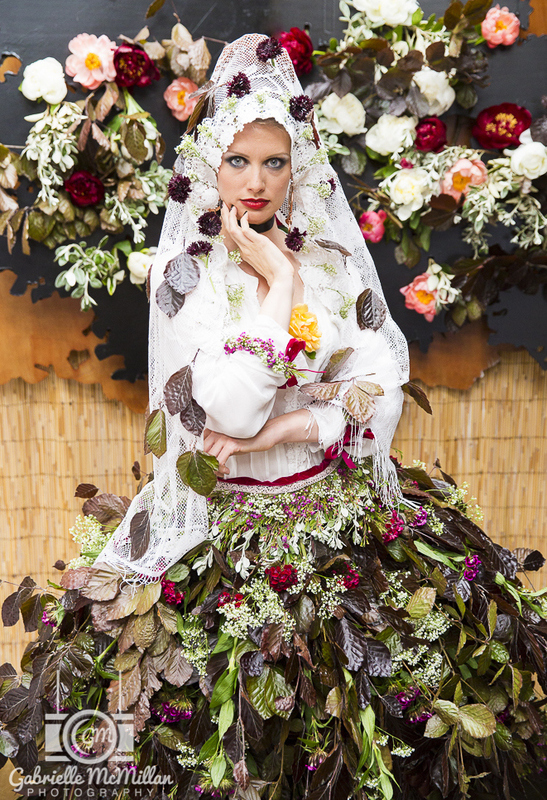 It’s a tricky question for a florist who whole-heartedly believes in British Flowers. Once Christmas is over and the flurry of collecting foliage, feathers and berries for wreaths comes to an end, a garden flower florist is looking at a long stretch until spring, with no blooms, bare twigs and no cash. Over the last 6 years I’ve mainly used this time to update my website, write courses and get some kind of overview on where my business is going. 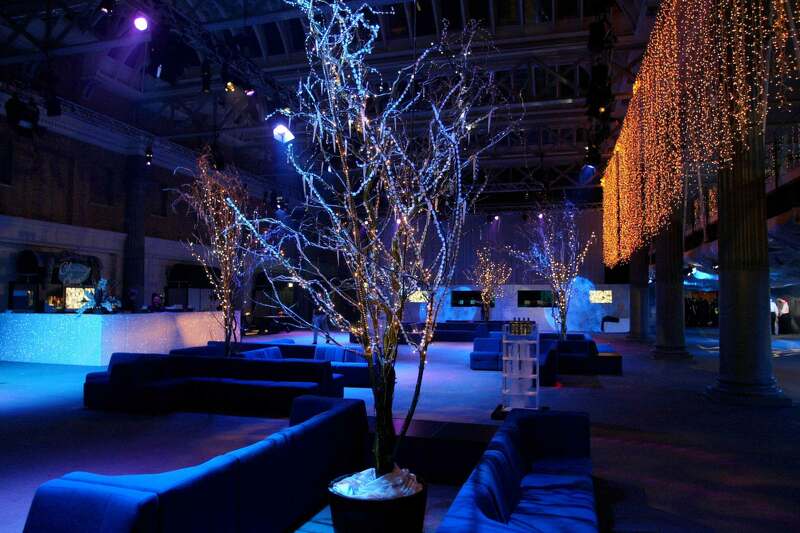 I also design events, that don’t really involve flowers. 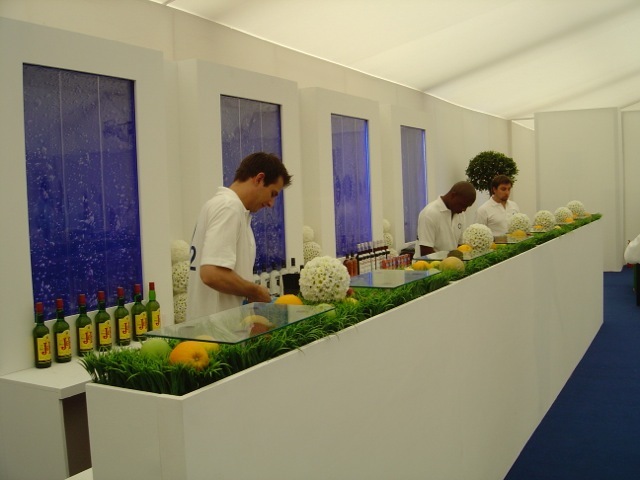 Before children I ran an Event Design business with mainly corporate clients( Microsoft, O2, Google) and have maintained a few of them. 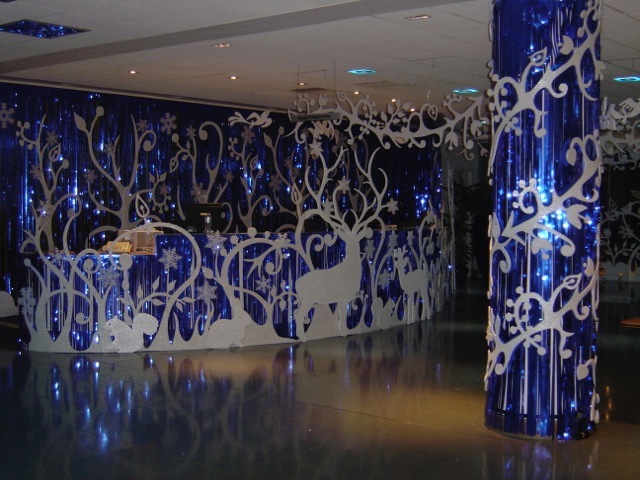 Here are a few shots of events I’ve designed. I hope you enjoyed that little photo journey through my events mostly sans fleurs. I’m not totally against using imported flowers when no garden flowers are available, but it always feels slightly strange to me and I always look for the most sustainable and seasonal products to use in my designs. Floral Circus will operate 12 months a year, I may have the odd weekend off through the summer (after six years, I’m looking forward to that!) My children are now a tad older and I’m ready to stretch my creative wings again. So, I’m hoping 2015 will bring some exciting design projects for Floral Circus. There are a few a foot already, which I’m just bursting to tell you about, but I must be patient! Still not great at that it seems.